Our first true luxury wedding film, that isn’t just a wedding film. As my better half is an incredible Architect on the London scene, The Shard building has been an ongoing topic of heated conversation between us since I arrived in London two years ago. Personally I love it, there’s something about London finally having an iconic building at height. It’s practical too, should your phone die you stand half a chance of navigating the City when you can look up and see the tips of glass as a reference point. Apparently though, from an architecture standpoint, it will forever divide opinion. What isn’t up for debate however is that Renzo Piano’s iconic design standing at a tallest building in Europe winning 1,016ft and featuring 11,000 glass panels is a stunning and luxurious wedding venue at the heart of a modern London. Irvine Sellar, who came up with the building concept initially, was told he had to hire a serious Architect for the design or else he could forget creating anything that Londoners would accept as part of the citys modern skyline. As part of that design there was, included on the 34th floor, a hotel opportunity. The Shangri- la hotel at the The Shard was born and with it a stunning centre point for London brides and grooms to get married. Forward to 2016 and a lovely, charismatic, excitable bride called Anika contacted us to film her civil ceremony wedding at the venue and a personal highlight of my own wedding season was ticked off. To get the opportunity to film a wedding at The Shard is something special indeed. There were times when we were the only two people on the entire Infinity Spa pool floor, no tourists, no hotel guests, just us and the cameras looking out at London in its British glory (all 4 seasons in a day). Initially we weren’t tasked with creating a luxury wedding film but indeed a choreographed list of shots which would form Anikas video Save The Date invite instead of the traditional paper invites. As always though we did film a little bit extra including handheld during the ceremony as we were certain Anika would want some of that after she seen the quality of the Save The Date film. 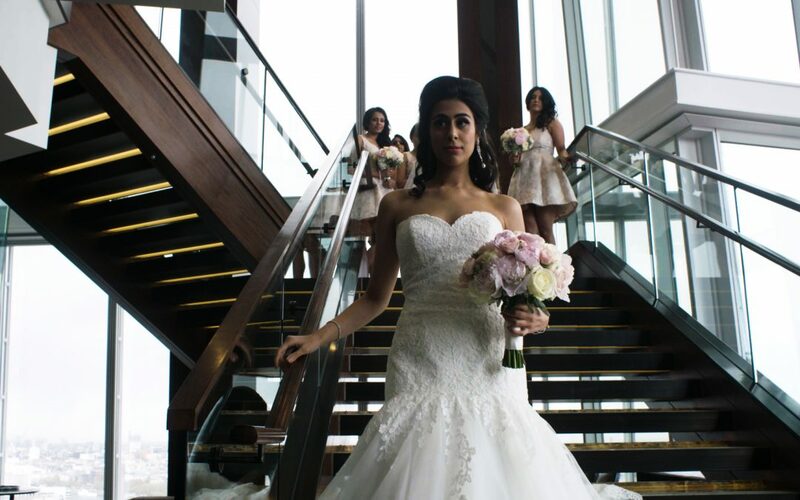 Fortunately she did and the footage didn’t go to waste, you can check our Anika and Anish’s wedding film from the Shangri- la below to see what all the fuss was about with such a great couple and luxurious venue. We hope to get the chance to film another luxury wedding film there again in the not too distant future for another fantastic couple. You can find out more about getting married at this venue here. We are award-winning wedding videographers for stylish couples, based in London, UK.